Boun Lod isn’t the only one who’s had a recent birthday. Linde Farley turned 65 in August, and Dave McNeill turned 70 a few days ago. Dave and Linde have been major supporters of, and fundraisers for, Boun Lod since they first heard her story in 2007. As part of their joint birthday celebrations, Linde and Dave decided to host a combination birthday bash and Boun Lod fundraiser that will take place in Waterton Park on Saturday, Sept 19. Funds raised will help with Boun Lod’s expenses for her next trip to the Cincinnati Shriners Hospital expected sometime in mid 2016. Thanks Dave and Linde! And thanks to all the folks who have already made donations, or who are planning to do so on Saturday. We’ll see you there. Boun Lod turned twelve on her birthday a few days ago. Boun Lod has been home in Lao for just over a year now. She is doing well, and is attending both Lao school and Vientiane College where she takes English classes. While in Cincinnati, we met Boun Lod and Noi’s friends Missy and Megan. Missy, Megan, and their whole family, have been very kind, welcoming, and helpful to Boun Lod and Noi. 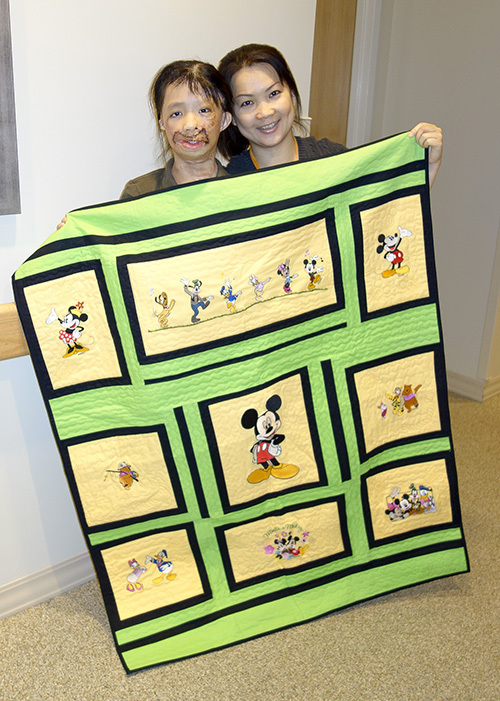 Missy and her family welcomed Boun Lod and Noi to their home for holiday occasions like Christmas and Easter, as well as for special occasions including birthdays. Missy and family also took Boun Lod and Noi out to places like the zoo, and helped them with daily chores like shopping. 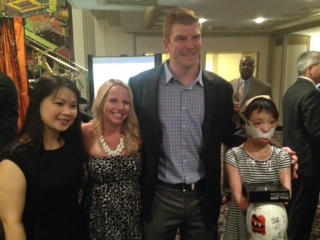 Boun Lod has become a bit of an ambassador for the Cincinnati Shriners hospital. 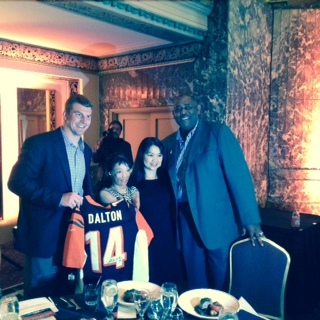 Boun Lod and Noi attended a fundraising event hosted by the Cincinnati Bengals, and met some of the players. Boun Lod even got up and said a few words to the three hundred people in attendance. On another occasion, Boun Lod was part of a group of kids hosted by the Cincinnati Reds at one of their home games. The kids were treated like celebrities, and got to run around the bases during the pre-game show. Apparently Boun Lod and Noi were a bit mystified by the game of baseball, but really enjoyed the atmosphere, the food, and doing “the wave”. During Boun Lod’s last stay at the Shriner’s Hospital the surgeons completed work on her scalp and hair, and did some additional reconstruction on her mouth and lip. When we visited in May, Boun Lod was reacting to the plastic mask that she was wearing to reduce scarring on her face. I asked her, “Is it a little bit itchy?” Boun Lod looked directly at me and said, “No, Gor-dawn, it is not a little bit itchy, it is a lot itchy!” She’s seldom at a loss for words. Boun Lod and Noi flew home to Lao on August 19, 2014. We don’t yet know when Boun Lod will return to Cincinnati for further treatment, but expect it will be sometime in mid 2016. Also, please consider donating Aeroplan miles to Air Canada's Kid's Horizons programme to help children like Boun Lod. For more information, or to donate miles, please go to the Kid’s Horizons website. On behalf of Boun Lod, her parents, and family, we thank you!